Independent Study - Business Starter Bootcamp: LESSON 11 - The Fortune is in the Follow Up! LESSON 11 - The Fortune is in the Follow Up! The Fortune is in the Follow Up! People are BUSY. Sometimes they'll start a conversation via email or Facebook message with you and then get distracted and stop responding. 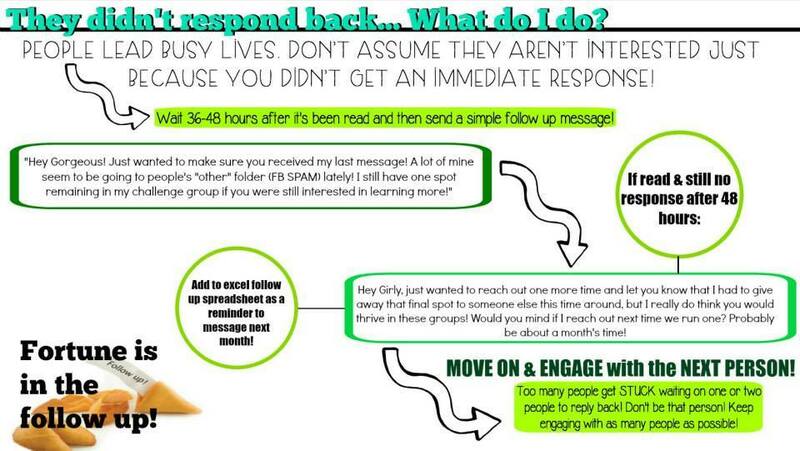 Or maybe they haven't even replied to begin with after you reached out to them! Most new coaches get nervous about reaching back out again. Or they think they should leave the ball in the customers' courts. But that is actually a big mistake! Because in our business, the FORTUNE IS IN THE FOLLOW UP! Because most people are busy and check emails and messages on the fly a lot of the time their last of response is just them being distracted, not necessarily them being disinterested. So do not decide for them. Go for no! That means, keep checking until they tell you they aren't into it or that now is not a good time. I can't tell you how many times I followed up with someone nervous that they'd think I was being too pushy and they told me how HAPPY they were that I reached out again because they had been so busy and forgot but that they are excited to get started! So remember... it is not your job to decide if someone is interested or not. And just because someone doesn't respond yet doesn't mean they don't want to join you. So follow up! "Hey there ______! I just wanted to check in again because I know you were excited about trying the 21 Day Fix and I wanted to make sure you got my message about how it's on sale right now. I think you're going to love it. Are you in with me for our group this month?" "Hey ______! I just wanted to make sure you go the link I sent! I'm saving you a spot in the group but I want to make sure you get your supplies in time so you need to get everything ordered soon. Are you getting stuck on anything I can help you with?" "Hey ______! I just wanted to follow up one last time because I know life gets busy. If this isn't the right time for you that's totally cool, don't be afraid to tell me. I know sometimes the timing is off. Would it be cool if I check in with you next time this program goes on sale so you can snag it if it's a better fit for you then?" "Hey ______! I just wanted to reach out and say that I'm sorry you didn't feel comfortable writing me back. I am here for you at any point in the future if you want to get plugged in with me! In the mean time, would you mind letting me know what I could have done better in our conversation to make you feel that you could have responded? This is my passion and I want to make sure I am becoming the best coach that I can be! I really appreciate any feedback you could give me!" Tracking Your Conversations: One you start talking to people, adding friends, and FORMing relationships you want to make sure to keep track of who all you are connecting with! There are lots of ways that coaches manage this. Some like to use a good old fashioned paper and pen. Others use a program called Streak. 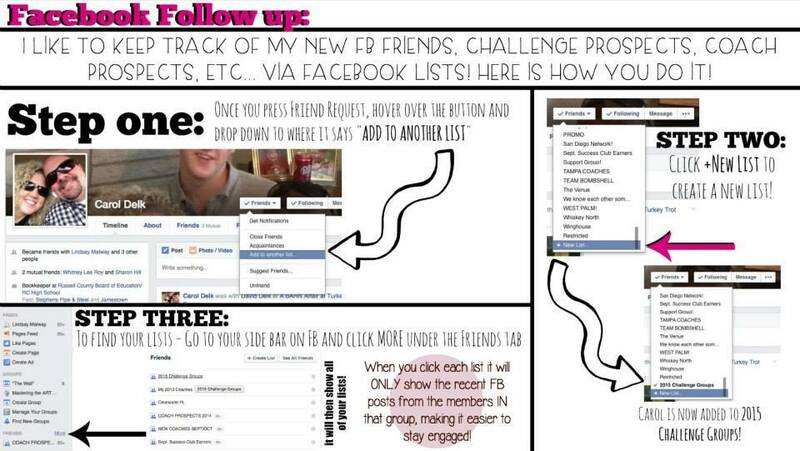 Others use Facebook lists like you can see in the graphic below. And me? I use a sticky on my computer with names broken into sections based on what part of the conversation process I am in with them. 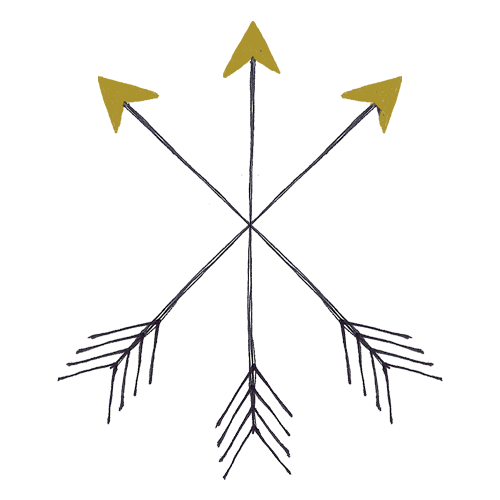 There is no 1 right way. The right way for you is whatever you will stick with that helps you not lose track of people! Don't get so busy creating systems though that you don't actually do your vital behaviors. Remember, done is better than perfect!